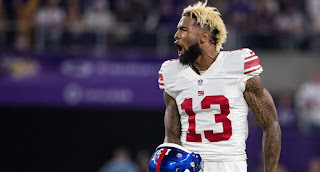 Home > football > NFL > New York Giants Could Kill Their Super Bowl Odds If They Trade Odell Beckham Jr.
New York Giants Could Kill Their Super Bowl Odds If They Trade Odell Beckham Jr. The owners of the New York Giants are filthy, stinking rich. So, the chances are good that they don’t drink much, if any, Cisco, Thunderbird, or MD 20/20. But with all the rumors floating around about their superstar wide receiver, Odell Beckham Jr., someone must be drinking something. General manager David Gettleman has tried to quiet the talk by telling anyone who will listen that “you don’t quit on talent.” But that statement kind of flies in the face of the latest rumor about OBJ and the Giants. The team has been swearing up and down that he is not on the block and they don’t want to trade him. But someone told Adam Schefter that it is not entirely accurate. 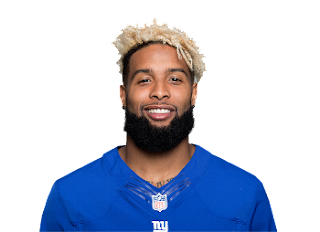 According to ESPN’s Adam Schefter, OBJ is available—for two first-round picks. The idea is an intriguing one. With Eli Manning not getting any younger the Giants will need to find their net quarterback of the future eventually. They could certainly take a promising candidate with the No. 2 pick in this year’s draft. But they could also take a much-needed running back like Saquon Barkley who could help them win now. If they did, it would not be hard to imagine their odds of winning the Super Bowl improving. According to Betway.com, their odds of winning Super Bowl LIII are 50:1 (as of 3/28). However, if they were to trade Beckham Jr., those odds would undoubtedly go up. Yes, even if they were to take Barkley with the No. 2 pick. Adding him to the backfield would add a dimension to the Giants offense that it has been missing since the 2010 season (when their run game ranked No. 6 in the league). Not only would the Giants have a run game, but Barkley is an excellent threat as a receiver coming out of the backfield. But the addition of his receiving skills would not make up for the absence of Beckham Jr. should the Giants trade him. In fact, trading him would damper Barkley’s shot at success since teams would load the box to stop him. It has already been proven that the current roster is not up to the task of replacing him. They got the chance to do so last year. Sterling Shepard led the way with 59 receptions for 731 yards and two touchdowns followed by tight end Evan Engram (64 receptions for 722 yards and six touchdowns). A case could be made for picking up a wide receiver in the draft assuming one of the two picks were in the coming draft. But whoever they take will not be able to take OBJ’s place. There are some good wide receivers available, but not one that compares to Beckham’s game. So—do they trade him? It all depends on how much faith they have in Eli Manning. The 37-year old quarterback didn’t have a banner year last season. But to be fair, he lost his two best wide receivers early in the year to injuries. He had no run game to take pressure off and a weak offensive line keeping defenders off him. With the offense being as bad as it was, the defense often got tired. The defense wasn’t playing great either, but with the offense being as bad as it was, the defense was asked to do a lot. But if Manning has his receivers back, a legitimate NFL-caliber running back, and a decent offensive line, the Giants could have an outside shot at the Super Bowl next season. They have beefed up the offensive line and added former Carolina Panthers running back Jonathan Stewart. Stewart may be past his prime, but with the right partner in the backfield—like Barkley -- he could be part of a dangerous tandem. However, if the Giants ownership and front office decide to look to the future and trade Odell Beckham Jr., it might be time for fans to crack open some Thunderbird or Wild Irish Rose. Either that or become a Jets fan.